‘Scarred for life I’ and ‘II’ are printed on thin off-white paper akin to scaled up pages from ‘Life’ magazine. The first series is of nine images, the second ten images. Originally designed to be pinned to the wall like street posters, Moffatt used photolithography (which was the most common form of printing used in newspapers and magazines in the 19th and 20th centuries) to print the works in faded colours, adding to their ephemeral effect. While ‘Life’ magazine in the 1950s and 1960s published photo-essays on major world events and presented different cultures to its primarily American audience, Moffatt takes the small yet traumatic humiliations of daily life – the sniping and jibing at difference, the feelings of inadequacy which may indeed scar us for life – and makes these stories equivalent in power. ‘Scarred for life’ is set in environments the very ordinariness of which contributes to the dramatic tension. Each suburban drama of familial slighting is at once horrifying as much as it is amusing because of its very mundanity. The viewer recognises similar events from their own past, or strange events that they have witnessed and not quite understood. Most of the tableaux take the point of view corresponding to or mirroring the wounded subject. It is this wounding and lack of resolution which then binds the viewer of the work to the viewer of the event described. Signed and dated verso, "Tracey Moffatt '94". George Alexander, Photography: Art Gallery of New South Wales Collection , 'Tableaux - memento mori - screen culture', pg.313-335, Sydney, 2007, 327. 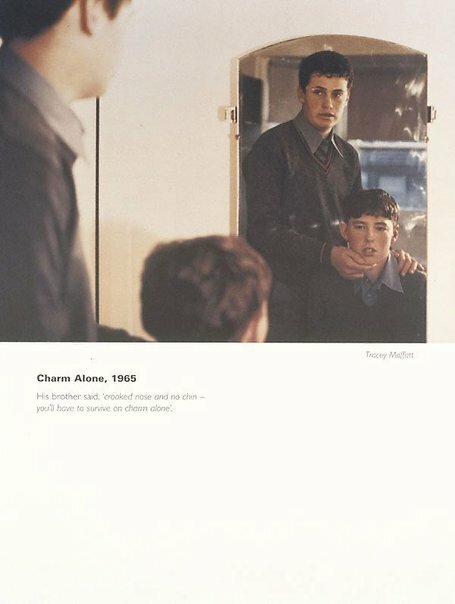 George Alexander, Contemporary: Art Gallery of New South Wales Contemporary Collection , 'Popism and screen culture', pg.204-245, Sydney, 2006, 208. Tracey Moffatt Fever Pitch , Sydney, 1995, 77 (colour illus). Gael Newtown, Australian Perspecta 1995 , 'Tracey Moffatt', pg. 70-71, Sydney, 1995, 70. Tracey Moffatt , Paris, 1999, 45 (colour illus. ).